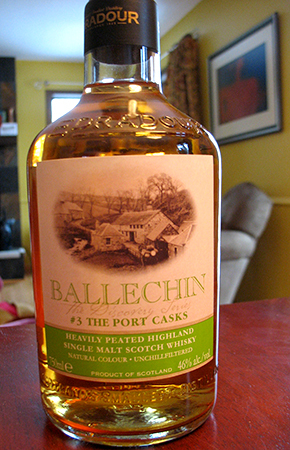 Ballechin is the name under which the Edradour distillery puts out its peated whisky. Edradour, which has a variable reputation, is one of the smaller distilleries in Scotland, and one of a number that lays claim to being the smallest distillery in Scotland–though what virtue there is in this title, I am not entirely sure. The distillery is owned by the independent bottler, Signatory and does a fair amount of experimentation with cask maturation, especially with the Ballechin line. Each release of Ballechin so far has been matured entirely in a different type of cask; in order: burgundy, madeira, port, oloroso sherry, marsala, bourbon and bordeaux. I have previously emptied a bottle of #4, which I quite enjoyed, and I have a bottle of #5 in reserve. Today, however, we have #3. Will it be as good as #4 or as weird as a single sherry cask Edradour I had a couple of years ago? Nose: The peat announces itself the moment the bottle is uncorked, and it is fairly Islay-like with a fair bit of iodine–not farmy as in many other non-Islay peated whiskies. The port is not much in evidence at first sniff. After a minute or so, there’s the port–a berry sweetness–but also some graphite and wood shavings. The peat turns farmy/barnyardy after a bit, but there’s still something vaguely coastal about the nose. Also something vaguely rubbery (like a new faux-leather couch). With a few more minutes it gets quite salty. After 10-15 minutes there’s quite a lot more sweetness along with dry, acrid smoke–not quite as charming as at first sniff; indeed, tonight it seems to be getting almost butyric. Let’s see if water helps: yes, water gets rid of the pukey note, and it also emphasizes the farmy smoke and brings back the wood shavings and pencil lead. It also brings out a musky note. Palate: Sweet peat, soot, ashes. Not very winey at all at first. There’s a sort of thinness–not of texture but of flavour (that probably doesn’t make very much sense). The sweetness seems to expand with every sip, but the ashiness doesn’t recede at all. After 10-15 minutes there’s not much sweetness at all: instead, as on the nose, a thin, dry, acrid smokiness. Water fixes the palate, makes it more unctuous, emphasizes the richer port notes and brings some darker fruit notes to the party as well. I think I may have added a touch too much, but I think this needs water for the palate to shine. After another 15-20 minutes it develops a very pleasant bell peppery quality–not unlike some sherried Caol Ilas. Finish: Long, ashy/sooty, turning quite salty. At the very end there’s a light cough-syrupy aftertaste, but the soot/ashes never go away. Water seems to switch the salt off. Comments: This would work very well as an after-dinner whisky, and you might even consider pairing it with cheese as you might do with port. It’s just a tad too sweet at first, and missing the richness and tannic bite of the oloroso sherry cask matured #4 to even it out. And both the nose and the palate seem, after a strong start, to fall apart a little with time–though water does help, and I would recommend adding it early. On the whole, very pleasant and more evidence against the religious position taken by some that whisky should not be matured in casks previously used to house anything but bourbon or sherry. I certainly prefer it by far to Glenmorangie’s port-finished Quinta Ruban, though it must be said that the Quinta Ruban now goes for almost half the price of this one in most US markets. The bottle was only opened a few nights ago, so it will be interesting to see how the bottle changes with time/air. This entry was posted in 85-89 points, Edradour. Bookmark the permalink. Four months later, and with the bottle now at the 1/3 full mark, this is far less sweet, and the smoke is now largely dry and the peat farmy/organic. The berry notes on the nose are largely gone and there’s a nice creamy sweetness in its place. Don’t know that I’d change the score. Wow, didn’t see this one coming – at all! This would give Laphroaig Cairdeas 2013 a good run for its money. In fact, if I had it blind that’s what I’d guess it is. The peat is very coastal and in-your-face, full of iodine, seaweed and ash, and with the benefit of hindsight the port is apparent, too. Great combo! It’s my first Ballechin, but based on your reviews and this experience, this seems to be a world into itself. Also, I’d easily have guessed cask strength on this, it punches way above its 46% weight. The malt backbone is solid enough to deal with all this peat, rather than be overwhelmed by it (like some others I had recently, including, sad to say, a couple Benriachs). I’d buy a bottle in a hurry. So far, the peat & port combo is 2 for 2 in my book, and it got my attention. Well, I did buy a bottle in a hurry, which was promptly finished (most of it by a visiting friend, who over the course of a week pretty much refused to drink anything else). And then I bought a few more bottles in a hurry. In any case, I also have the #2 Madeira open, which you are free to sample – I don’t see it reviewed on the blog. Indeed, I’ve not had and nor do I own the Madeira cask, so I’d be interested in that one for sure.